Two saplings were planted on the school grounds Tuesday by Chief Executive Officer of GraceKenndy Group, Don Wehby, along with students of the institution. It was the first stop in the Grace and Staff Foundation’s effort to help with a part of Jamaica’s 2030 vision, which is to improve the natural environment. The 95 saplings donated to Calabar Infant, Primary and Junior High were among the 595 GraceKennedy Group purchased from the Forestry Department. Aside from the two that were planted, the other 93 went to teachers and students to be planted and nurtured by them. 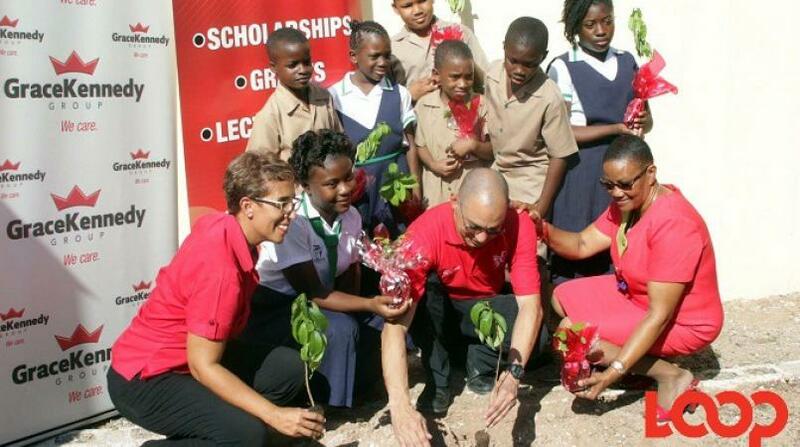 GraceKennedy Group will be giving away the other 500 saplings at the company’s various locations across the island. Wehby, in an interview with Loop News, said the trees will help the school and Jamaica eventually, in a major way. Wehby said, “we believe a healthier environment is a healthier Jamaica. Last year, at our 94th birthday, we actually cleaned the harbour. We called it the harbour haulage and that went quite well. “This year, we decided that as part of planting one billion trees per year, as part of the UN initiative, we wanted to contribute to that in terms of a better environment. “Also, when you have a proper environment in terms of trees, it will help in removing carbon dioxide and there are a number of other benefits in terms of having trees, (including) in terms of landslides, it prevents that." What's more, Wehby noted that a lot of the 595 trees that Grace is donating are fruit trees, "so it will be self-sustaining," he said. "So, at some point in time, hopefully the schools will be reaping their own fruits and that is something that I am really looking forward to,” Wehby said. Principal of Calabar Infant, Primary and Junior High Joset Leslie, said, “it’s wonderful that Grace can come on board and be a part of this. We are an inner-city institution and so we appreciate any help that we can get. “We have had a long relationship with Grace. They are part of the nutritional product that we supply to the kids here and so we are grateful that they can be here to be a part of this wonderful initiative,” Leslie said.